The tie features NFL team logos. Toronto Mayor Rob Ford addresses media at City Hall in Toronto on Nov. 5, 2013. TORONTO — A tie purported to be the one late Toronto mayor Rob Ford wore on Nov. 5, 2013, when he admitted smoking crack cocaine, is up for sale on eBay again. There were 111 bids on the tie over a seven-day auction in 2015, with the winner putting in a bid of $16,100 for the neckwear featuring logos from NFL teams past and present. The tie is currently listed on eBay with a buy-it-now price of $9,999. 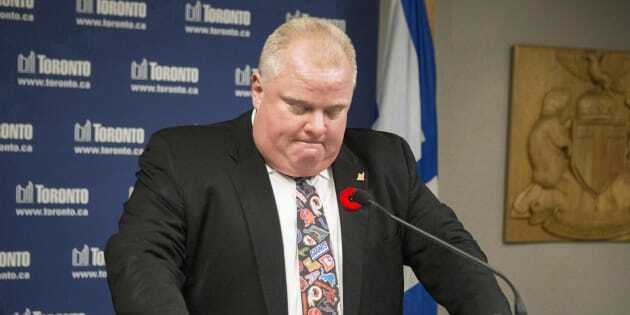 Detail of the tie used by Toronto Mayor Rob Ford during a press conference where the admitted he smoked crack. The listing says the tie is "professionally framed" and comes with a certificate of authenticity signed by Ford as well as the actual box he shipped it in. Ford's assistant said at the time that he sold the tie and other items on eBay as part of a spring cleaning. Ford became internationally notorious when he admitted having smoked crack cocaine, "probably in one of my drunken stupors," while apologizing and insisting he was not an addict.